Leadership is a transactional process between leaders and followers that affects all parties. It involves the influence of leaders upon their followers, and occurs in groups or teams, spanning small working units, organizations or an entire culture. However, it is easy to confuse leadership with other potentially influential concepts such as power, coercion and management. Referent power is interpersonally based; it is established when a leader is well-liked by his/her followers. Expert power is based on competence; followers perceive that the leader is knowledgeable. Legitimate power is based on status and is obtained by formal appointment of authority. Reward power is based on the ability to grant rewards in exchange for the followers’ efforts. Coercive power is based on the ability to penalize or punish followers. Information power is based on the possession of knowledge or information that others want. In practice, power has been exerted by leaders for good and bad purposes throughout history, but research on the role of power in leadership is quite limited. One thing we know is that a recent shift in information-sharing and technology has decreased the legitimate power of leaders because transparency and accountability encourage them to be more responsive to the calls of their followers, thereby facilitating group success. Those who use coercion do so for their own benefit. Such leaders have little regard for their followers’ wants or needs, and no sense of a common goal. Thus, coercive influence is infamous throughout the history of dark or toxic leadership cases. 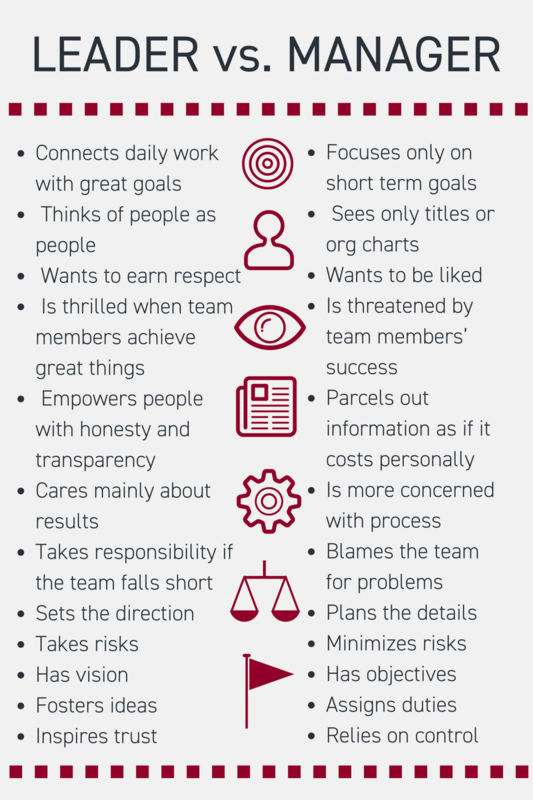 Because management and leadership are similar in many ways, the differences are rarely distinguishable. The concepts are distinct from each other regarding functions and activities. Leadership is similar to management because both involve influencing people, interpersonal work in groups, and a focus on common-goal achievement. The key difference is that management produces order and consistency, and leadership produces change and movement. For optimal success, organizations must cultivate successful management and leadership. Management without leadership will result in bureaucracy and complacency with the status quo. Leadership without management will result in misguided employees and wasted effort. The organization will benefit from the order and task focus established by management, and will flourish with the visionary and interpersonal nature of leadership.